The Gin and Tonic – what better a drink during the dog days of summer? Put some ice in a glass, pour one part gin, add another part tonic water, finish with a slice of lime, and you have a refreshing drink to counter the heat. But it is also steeped in the history of medicine, global commodity frontiers, and the expansion of the British Empire. Let’s start with the gin. Although it is commonly known as the quintessential English spirit, the history of gin underlines the island’s connections to the outside world. The origin of gin – unlike the drink itself – is quite murky. Sylvius de Bouve, a sixteenth-century Dutch physician, is the individual associated with the development of gin. He created a highly-alcoholic medicinal concoction called Jenever. It featured the essential oils of juniper berries, which the physician believed could improve circulation and cure other ailments. The berry, deriving from a small coniferous plant, had long been treasured for its medicinal properties, including its use during the plague. Some students of the spirit argue that English soldiers discovered it while fighting in Holland in the 1580s during the Dutch War of Independence, whereas others trace England’s gin tradition to the Thirty Years’ War (1618-1648). The English nicknamed the drink “Dutch courage,” but what stuck was gin, a derivation of the Flemish word genever. Gin’s popularity grew in England after William of Orange had become King of England following the Glorious Revolution of 1688. Parliament exerted its superior authority by ousting from the throne the Catholic King James II. With William’s reign came high import duties on French brandy – the dominant hard liquor in England at the time. The English began to produce a gin at a low cost. As John Watney notes in Mother’s Ruin: A History of Gin, “[a] revolution in drinking habits, equal to or perhaps surpassing in importance the Glorious Revolution in politics, was about to occur.” Parliament ended the royal monopoly on spirit distilling within London and its surrounding area, and statutes promoted distillation from grain grown by English farmers. Gin consumption exploded in England by the first half of the eighteenth century. London became the capital not only of a growing empire, but also the drinking of gin. 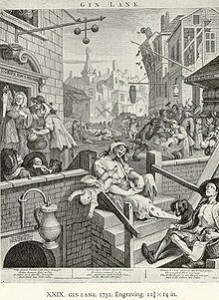 The apparent rise in public drunkeness led to the “Gin Craze,” a moral panic in which elites began to worry about the amount of gin consumed by less-affluent classes. The British Parliament responded to the craze by enacting a series of laws starting in the 1730s that sought to curb the consumption of gin. Historians such as Jessica Warner have compared such policies to the war on drugs in more recent times. At first, British lawmakers imposed a stiff tax on gin, but this policy led to a flood of illegally-distilled gin. Riots against the law erupted in 1743. By 1751, the government changed their strategy to favour a policy that increased the operating costs of gin shops. The craze waned, although scholars argue that consumption declined because of rising grain prices, not government action. Nonetheless, gin remained a popular spirit in England. “Gin Lane” (1751) by William Hogarth. Image from Wikipedia. I’ve added one part gin to the glass, but what about the tonic? It too is rooted global relationships that stretch even farther than gin. 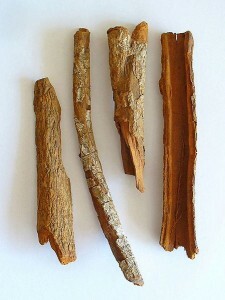 A key component of tonic water is quinine, an anti-malarial alkaloid from the bark of the cinchona tree. Indigenous to mountainous areas of South America, the tree is part of what historian Alfred Crosby has termed the “Columbian Exchange”: the transfer of humans, other animals, plants, germs, and ideas between Europe and the Americas. The Quechua (Inca) peoples of Peru and Bolivia had long understood the cinchona tree’s ability to stop shivers in cold temperatures. Europeans first realized the value of the plant in fighting malaria during the seventeenth century, after the Spanish had conquered parts of South America. Two popular accounts explain the development. In one, the Countess of Chinchon, wife of the Spanish Viceroy of Peru, brought the bark to Spain during the 1640s after it had cured her of malaria in South America. In the other, a Jesuit missionary returned to Europe with the bark in 1632. No matter its origins, Europeans began to call ground cinchona bark “Countess’ powder,” “Jesuit’s powder,” or simply the “fever tree.” By the early nineteenth century, chemists had isolated quinine from cinchona bark. It formed an essential ingredient in tonic water. Cinchona bark. Image from Wikipedia. Adding gin to tonic water originated in India during the nineteenth century. In 1825, British officers began to mix gin with their daily ration of quinine tonic. After the Sepoy Rebellion of 1857 (or the “Indian Mutiny”), the British Crown took over the governance of India from the British East India Company and strengthened its presence on the subcontinent. The growing number of Brits residing in India by the late 1850s helps explain the increased demand for quinine and the rise in popularity of the gin and tonic. The British Raj led to a greater concern for the health of the more and more British soldiers, colonial administrators, and families living in India. Control of the colony required the ability to fight the deadly disease of malaria, so Brits in India consumed rations of quinine in the form of “Indian tonic water.” They added gin to the liquid to cut its bitter taste (and probably also for an intoxicating effect). But there is more to the story of tonic water and the British in India. Lucile Brockway has shown that control of cinchona – and thus quinine – was key to the expansion of European colonial powers during the nineteenth century in Asia and Africa. By mid-century, the cinchona-producing areas of South America had become independent republics. Cinchona, grown as wild stocks harvested by native communities, offered an important commodity for their economic development. In 1860 alone, South America exported around two million pounds of cinchona bark to Britain and the United States. European powers, namely the British and the Dutch, feared a South American monopoly on the product raised prices, so they smuggled the plant’s seeds back to Europe, created hybrid strains, and transferred cinchona to plantations in Asian colonies like Ceylon and Java. By century’s end, the Dutch controlled most of the cinchona trade. Tonic water found in stores today must contain only minimal amounts of quinine. Recently, a number of premium tonic waters have hit the market. These brands advertise their use of natural quinine (rather than synthetic forms) and their avoidance of high fructose corn syrup, which connoisseurs claim overpowers the bouquet of high-quality gin. One brand is even called Fever Tree – harkening back to the historical roots of the beverage (although its website relies on the language of danger and exploration reminiscent of the colonial era). 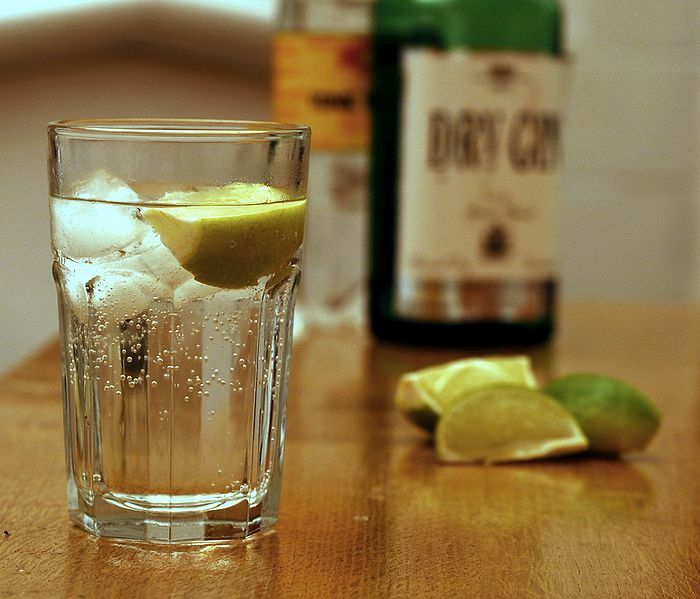 Of course the final component to the classic gin and tonic is a slice of lime, and it is also linked to disease prevention and European expansion. In 1747, British surgeon James Lind carried out an experiment on mariners aboard a Royal Navy ship. His findings illustrated that a lack of Vitamin C caused scurvy. By the late nineteenth century, Royal Navy ships provided a mandatory daily ration of limes for sailors to fight the disease (hence the British nickname “limey”). So next time you sip a G n’ T, stop and think about the history in your glass. Thanks to Christopher Wilton for his helpful comments on the development of gin. Jay Young is an editor at ActiveHistory.ca. He recently completed a PhD in history from York University. This entry was posted in Historical Research and tagged Active History, British Empire, cinchona, colonialism, commodity frontiers, gin, imperialism, malaria, medicine, quinine, tonic by Jim Clifford. Bookmark the permalink. Thanks, Paul, for reading the post and offering another fascinating dimension to the imperial history of gin. Although many spirits brands play off of the history and local identity of their drink (rum and bourbon come to mind), gin seems particularly so. Even the bottle for Victoria Gin (a premium gin made by a company on the west coast of Canada) draws from an imperial identity, as it features a portrait commissioned in the early 1840s of Queen Victoria by the German artist Franz Xaver Winterhalter. Best of luck with your research. A very interesting article. It’s worth thinking too about the way in which gin companies advertised themselves to imperial settlers as a real taste of the old country. Gin was marketed as unique to London and the company in which I am interested began to associate itself to the Tower of London and the Beefeaters. This increased the cultural Britishness of the Empire. However, it may also have alienated the colonised, who saw the impact of alcohol on their ‘superiors’. Orwell’s Burmese Days is full of references to drinking gin before breakfast.